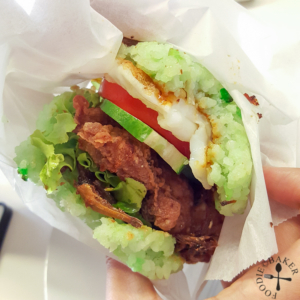 When I first read about the launch of the special Nasi Lemak Burger by a popular fast food chain in Singapore 2 weeks ago, I was intrigued but not that interested because I’ve always liked my food in their original form (I’m boring I know). X, on the other hand, was quite interested to try it (we were scheduled to go back to Singapore in August, so he thought the special launch will still be around that time). Around the same time, my friend (who’s also residing in the same country as us) told me that the whole Nasi Lemak meal costs a whooping SGD 9, which was – to me at least – quite a rip-off! So last week, when X and I met up with our friends for our weekly dinner, we talked about the Nasi Lemak Burger again and I went to Google the burger to see why so many people are so crazy about this burger – imagine my horror when I realised there’s no rice at all in the burger! “Nasi” means “rice” in Malay, and the rice (cooked in coconut milk and pandan) is the soul of Nasi Lemak, so it just doesn’t make sense to me that that thing can pass off as a Nasi Lemak Burger (again, let me emphasise that I’m boring and I like my food in original form). 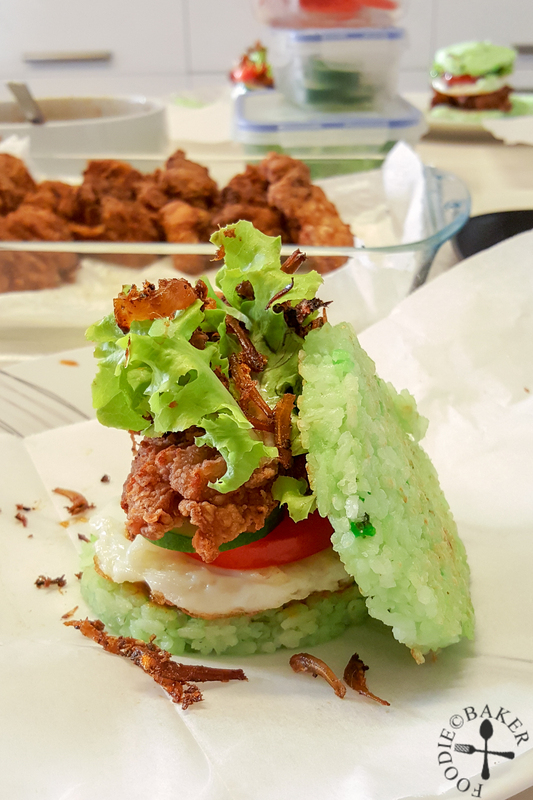 To cut this already long story short, my friend and I decided to make the Nasi Lemak Burger ourselves – and that’s how our Nasi Lemak Burger came about! All photos in this post are taken with my phone, so pardon the image quality! 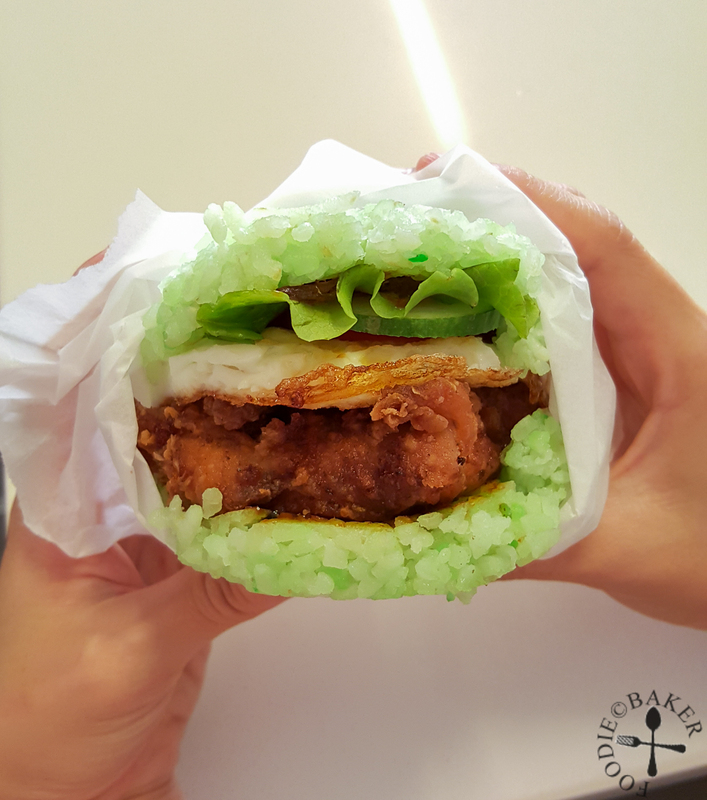 The first, and most important component in our Nasi Lemak Burger is the rice. Long-grain rice is originally used for a traditional Nasi Lemak, but because we wanted to substitute the burger patty with rice patty, my friend and I opted to use short-grain rice instead. Short-grain rice is starchier, hence more sticky, so they can stick together to form a patty. We used Arborio rice, an Italian short-grain rice that is commonly used for risotto, as the quality of the Japanese short-grain rice we get here is sub-par. In Singapore, Japanese short-grain rice or Arborio rice will work perfectly. The rice is then cooked in a mixture of coconut milk, water, salt, pandan paste and pandan leaves (which I brought back from Singapore previously). We used pandan paste to give the rice a nice green colour, but it can be omitted if you don’t have it. 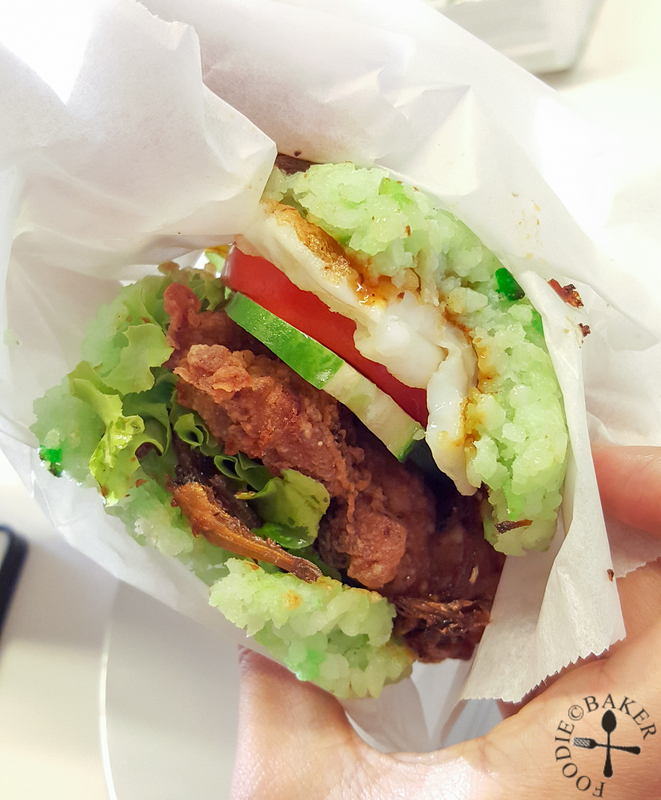 My friend was the one who thought of using a ring mould to shape the rice patties – the ring moulds really help to make the patties the same size. The patties are slightly grilled in a non-stick pan before assembly, because we thought that it would help to make the rice stick together better. 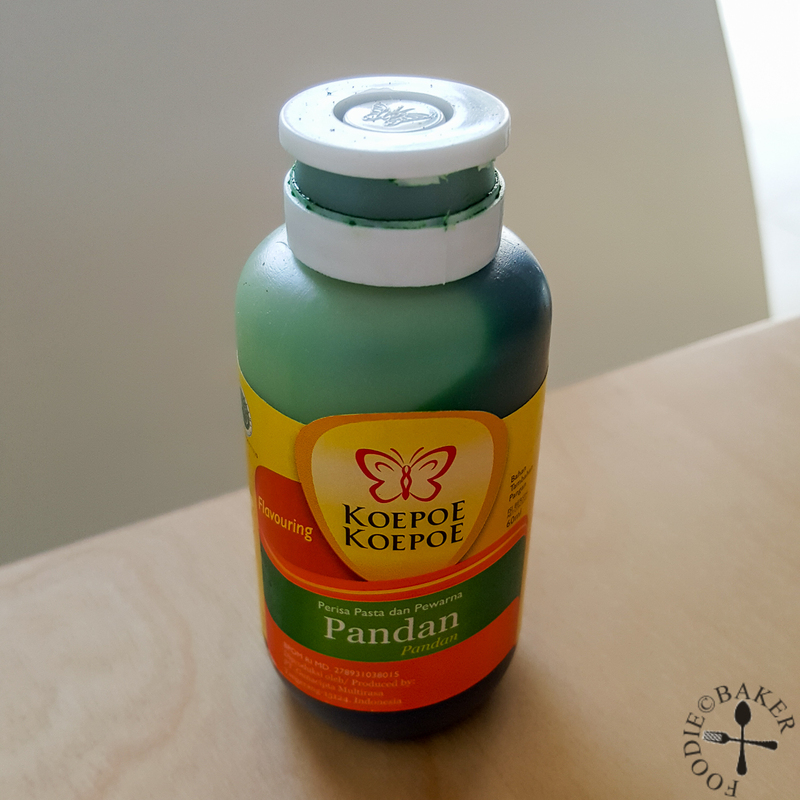 The brand of pandan paste we used to colour the rice green. 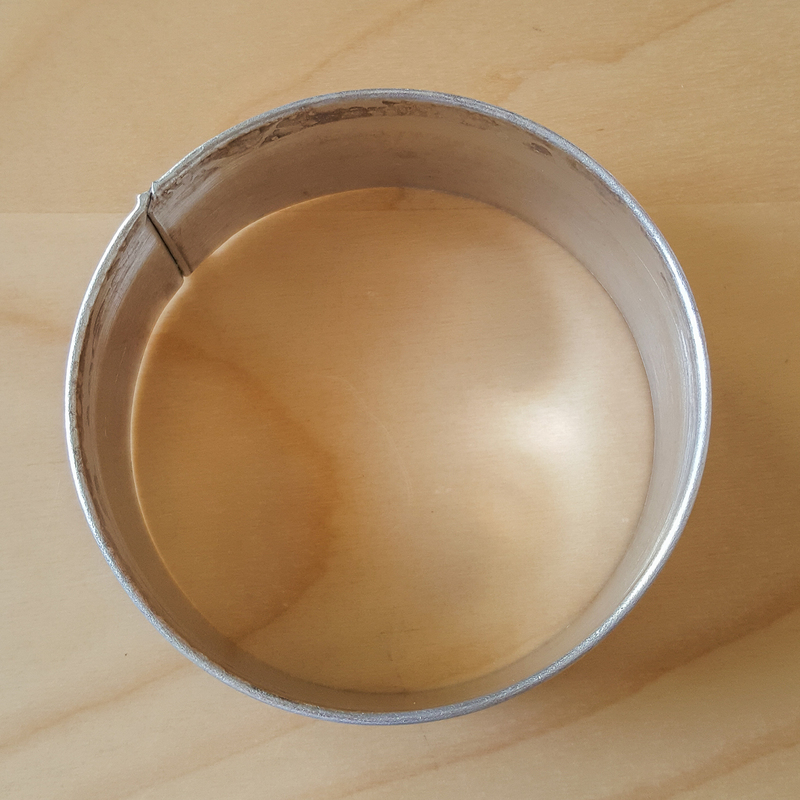 The 9-cm ring mould that we used to form our patties and to fry our sunny-side eggs. Next up is the Fried Chicken. We used boneless chicken thighs, halving them so they can fit into the burger. My friend marinated the chicken the night before, and we coated them with seasoned flour and double-fry them to get crispy and golden fried chicken. The sambal chili my friend have is really spicy on its own and too thick to be spread in a burger, so we mixed it in a sugar syrup and thicken it with corn starch water to make the Chili Sauce. 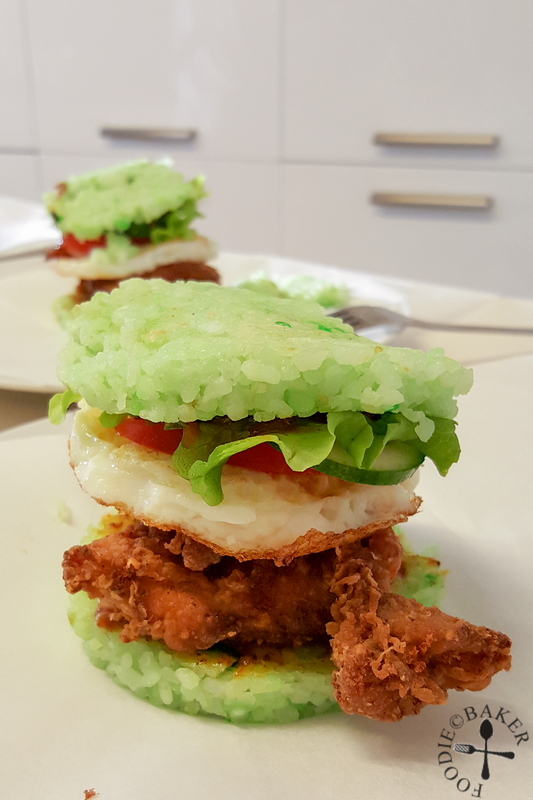 It was surprisingly very easy to make and worked perfectly in our Nasi Lemak Burger. For the Ikan Bilis, my friend stir-fried the ikan bilis (anchovies), sambal, sugar and onion together but the resulting ikan bilis aren’t as crispy, so if we make this again (not sure when will that be haha :p ), we would probably fry the ikan bilis until crispy first, then cook them in the sambal, sugar and onion mixture. We assembled the burgers on parchment papers because the rice patties are still quite fragile, even after using short-grain rice and grilling them. Some of the patties did break apart while we were assembling the burgers. The parchment paper helped to hold the Nasi Lemak Burgers together without the rice falling everywhere. Overall, we were extremely proud of what we had accomplished – our burger is a true Nasi Lemak Burger with fragrant coconut rice, crispy fried chicken, and fiery good chili sauce and ikan bilis. All the components were perfect – I’m sure we would all enjoyed it even if it’s not assembled into a burger! Prepare the vegetables (slice the tomatoes and cucumbers), keep them in the refrigerator until assembly → Cook the ikan bilis (can actually be made a day in advance, see recipe below for more details) → Make the chili sauce → Wash and soak the rice → Take out the chicken to come to room temperature → Cook the rice → Fry the chicken → Cook the sunny-side eggs → Form the rice patty and grill the rice patty → Assemble the burgers and dig in! Place rice in a bowl and rinse several times until the water is almost clear. Soak in water 30 minutes. Whisk coconut milk, water, salt and pandan paste in a measuring cup. Drain the rice well over a sieve and transfer into the rice cooker. Pour in the coconut milk mixture and add in the pandan leaves. Cook using normal rice cooker setting until the rice is done. Turn off the rice cooker (don't use the "keep warm" function) and let the rice steam for 20 minutes. Heat a non-stick frying pan without oil over medium-low heat. Using a large spatula, slide the rice patties onto the frying pan (do this in batches). Cook for 2 to 3 minutes on each side until slightly charred on both sides. The rice patties are now ready for assembly. - We used boxed coconut milk (packed in carton) for the recipe. If you can get fresh coconut milk, good for you! Canned coconut milk will work too. If using boxed or canned coconut milk. Sometimes, boxed and canned coconut milk may separate (cream on top, liquid at the bottom), so it's best to shake the box/can before opening to make sure the contents are well-mixed together. - We used Koepoe-Koepoe pandan paste for the rice - a little goes a long way so don't add too much. Mixing the pandan paste into the coconut milk and water first will help dissolve the paste and make the rice colour evenly. If you don't have pandan paste, you can omit it, the rice will just be white in colour. - Alternatively, you can blend additional pandan leaves with a little bit of water and squeeze the pulp to get pandan water. Top up the pandan water with water until you get 1 cup of liquid. Use this to combine with the 2 rice cooker cups of coconut milk. - We used short-grain rice instead of long-grain Thailand rice because of short-grain rice's sticky properties which helped to hold the patty together. That being said, the rice patties are still pretty fragile so handle them with care! Because it's impossible to hold up the burger with our bare hands without the rice patties disintegrating, hence it is a must to wrap the burger up with parchment paper during assembly (think MOS Burger). Trim the chicken thighs off excess fats. Halve each chicken thigh. Pat dry and combine with the Marinade ingredients (light soy sauce, sake, sesame oil and black pepper). Mix well, cover and let them marinate overnight in the refrigerator. Take out the chicken from the refrigerator and let them come to room temperature 30 minutes before frying. Combine Frying Flour ingredients (flour, mixed dried herbs, salt, paprika, cumin and five spice powder) in a large bowl. Add oil into a deep pot until it's 3-cm deep. You can use a smaller pot and fry the chicken in batches. Heat oil until it reaches 170C. While the oil is heating, coat the chicken thighs thoroughly with the flour mixture. Line a large serving plate with paper towels to absorb oil. When the oil has reached 170C, lower the chicken thighs into the hot oil and fry for 7 minutes, flipping once, until the chicken is cooked through. Try to maintaining the oil temperature at 170C as best as you can. Remove the chicken onto the serving plate. Repeat until all the chicken are fried. Heat up the oil until 190C and add in the chicken pieces again, this second fry will make the chicken crisp and not greasy. Fry for 1 to 2 minutes until it's a deep golden brown. Remove the chicken onto the serving plate to drain. The chicken is now ready for assembly. Whisk water, Worcestershire sauce, sugar and sambal chilli in a small pot and bring to a boil. Turn down the heat and simmer for 5 minutes. Taste and adjust the sauce with more sugar or sambal. In a separate small bowl, dissolve corn starch in water. Whisk the corn starch water into the pot until the sauce thickens. The sauce is now ready for assembly. - You can double the sauce if you love smothering your Nasi Lemak with chilli. The sauce will be good as a dip for fries as well! - Normal sambal chilli cannot be used as it's too thick, hence we incorporated a syrup to loosen the consistency. The corn starch water then thickens it into a spreadable consistency. Remove the heads and intestines of the ikan bilis - these parts will make the ikan bilis bitter so it's best to remove them. You can get cleaned ikan bilis from the market too to save you some time. Fry the ikan bilis in a little oil until they are golden and crispy. Alternatively, you can bake or air-fry at 190C until they are crispy. In a non-stick pan, cook onion, sambal chilli (the chilli is oily so no additional oil is needed) and a little o until onion is softened. Add in the ikan bilis and coat the ikan bilis thoroughly with the chilli. Add more sambal or sugar if needed. Remove from heat and let cool. The ikan bilis is now ready for assembly. - If you don't like/need your ikan bilis to be crispy, you can just stir-fry everything together in the pan. - The ikan bilis can be made a day ahead. Let cool, cover and refrigerate. The next day, spread the ikan bilis on a tray and bake in the oven at 175C until heated through and crisp again. - We used Taho's brand Sambal Belachan (red cap). Fry each egg into a sunny-side egg - use the same ring that you used for the rice patties so they are the size. Place 1 rice patty on a parchment paper. Place it closer to the shorter edge of the parchment paper so you can lift up the other side to wrap the burger later. Spread the top of the rice with Chili Sauce. Place the sunny-side egg on top of the rice, followed by Fried Chicken, Vegetables (just a little will do) and Ikan Bilis. Top with a bit more Chili Sauce. Carefully place the second rice patty on top. Serve the burger - lift up the other side of the parchment burger over the top, tuck in the sides and use your hands to lift up the entire burger. Enjoy with the rest of the Chili Sauce and Ikan Bilis! - The rice patties will just disintegrate if we try to hold the burger with our bare hands. So getting our inspiration from MOS Burger, we wrapped up our burger with parchment paper. I am going to try these, it sounds incredible. Hi Jasline, I love your real nasi lemak burger. It look so inviting and sinfully delicious. I think 2 for me should be no problem. Thanks for sharing your ideas and recipes. You must have a super big stomach to consume 2 nasi lemak burgers! I’ll gladly make this for you anytime! Apparently somebody copied your idea on youtube. Here is the link (link removed). Hi Hadi, thank you for sharing the video – it’s a bit different from what I did but I’m okay with it, hopefully it will encourage more people to give this burger a try at home! Jasline this is such an informative post! Love all the detail and deliciousness wrapped up into one. I really need to check into that pandan paste and see if I can purchase on line. Enjoy your your visit back home! Hi Bobbi! I hope people will be encouraged to make it at home 🙂 I found the Amazon link to the pandan paste here. I forgot to mention that it’s actually artificial pandan flavouring but it’s the best substitute when no fresh pandan is available! All the hype about McD. Nasi Lemak burger, well, this is my kind of nasi lemak burger, with NASI ! 🙂 It’s just not the same without the rice! Well done!